Analogy: Smithson. Create/design a feature of the local site as a figure/trope expressing a force organizing the scene or situation. Target/tale: Tarot. An Existential Positioning System (EPS) enabling DYI comparisons between individual and collective experience. Target/Analogy/tale: History of the Senses. A goal of Konsult is to augment and formalize individual encounter with sensory experience at the level of macrocosm. Konsult Design. The experiment proposed for this semester is to create a Prezi konsult, in which the egent (you) serve as querent. The hybrid poetics proposes to use tarot consultation as an interface to generate a bachelor machine figure, evoking a tropical relation between the querent and the Non/Site of the Accident (Koppers Superfund Disaster). Layer One: Pollack's Guide to Tarot is our relay. We are creating our own deck, at least in part, in that we will start with a reading, and then update the cards drawn using the materials of our own scene as archive. The reading requires that we first create our own spread. The purpose of this spread is to question the Accident, as a figurative translation of the conditions of our history into an archetypal form, for further thought and action. The spread should consist of ten "cards," having in mind the complexity accomplished by the Celtic Cross. To compose the slots for the spread, draw upon the sorts of questions found in the Celtic Cross, keeping in mind that the goal is to activate an association between our Once allegory and the Accident Site. Some further suggestions for the spread questions are found in ways to get to know the cards (p. 163), in getting to know a deck: What special message do you bring? What do you want to teach me? What do I need to work with you? The section on Interpretation of Tales (p. 172) models further design strategies, tailoring the questions to a specific tale (to the Accident in our case). Soul Questions (p. 174) are adaptable to our purposes as well: What is (Accident)? Where Does it Come From? How Does It Teach Us? 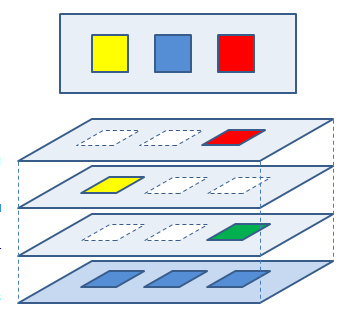 A spread suggested in another source is used to question a particular card, to ask what it means: 1 = The card does not mean this. 2 = The card means this. 3 = The card is good for this. 4 = The best course of action. Be sure to include questions that ask about your relationship with Accident. Layer Two: There is considerable room for invention in this adaptation of tarot to konsult. The correlations listed here are points of departure. Once Allegory (Part One Einstellung). The movie in your Allegory of Prudence = trump cards of the major arcana. Significant people in your anecdotes = court cards. Layer Three: Koppers Superfund Site may be a source for any card in principle, but consider especially the pips of the minor arcana, which trace processes from inception through excess, corresponding to the elemental system of the tradition (Earth Air Fire Water). Layer Four: Use History of the Senses to augment the sensory features of your Once Allegory, as basis for any card in principle, with attention to the minor arcana. Significator: The Fool's Journey passes through our scene. A good way to select the Significator is to use the dates method (pp. 166-67). "Card" Design: There is no need to put the features selected from your archive into emblem form, as in the formally designed decks. However, the kinds of properties promoted to symbolic status in the formal decks are a useful guide to what to include in the features used to represent the updated "card" in your Prezi map. Modernist collage works are a valid relay for our purposes. The arrangement of the spread may take any shape. Translate/update the cards drawn for each of the places in the spread, using the spread as a grid of chance to select some feature from the other layers of the assemblage. The effect of juxtapositions thus produced should in principle generate an evocative tropical figure.